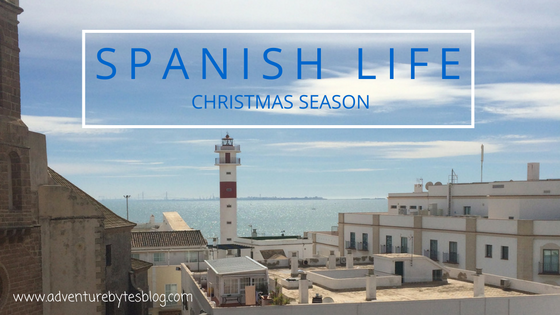 Spain does Christmas and the holiday season a little different than what many Americans are used to, so here is a little about the Spanish way of celebrating the holidays -- and how we spent our first holiday season in Spain. And while you may think I am late to game on posting about Christmas, you should know that the holiday season in Spain does not end until January 6! Spain does not celebrate Thanksgiving (its an American holiday) so their Christmas season starts more during the four weeks of advent as well as on December 8, the national holiday celebrating the Feast of Immaculate Conception -- remember Spain is predominately a Catholic country so much of their holidays and celebrations revolve around the faith. But things really get going on the 22nd of December when school vacation finally starts and much of the country buys lottery tickets in hopes of winning el gordo (the fat one). Because we live in Spain, we have been told that we can buy tickets -- but sadly, we were all sick on December 22 so we had to pass up the lottery this year.... next year I will be getting tickets for sure! December 24 or Nochebuena (good night) is when the whole family gathers for a big meal -- in the north of Spain, many people cook lombarda which is purple cabbage made with garlic, olive oil and salt. Then it is eaten with bread or crackers. It sounds gross, but I have tried it and it's actually really good. After a day spent eating and being with family, everyone heads to midnight mass. While we didn't go to mass, we did spend the evening with some very close friends. Serafina had a blast playing soccer for hours on end with the other kids, while the adults ate and drank to their hearts content. It was such a fun Christmas Eve. Christmas -- Navidad -- is a day spent relaxing and being with family, but not opening presents. Yep, Santa does not come to Spain... However, Santa visited this house in Spain! We had a wonderful morning opening presents, although Serafina opened one present and then just wanted to play with that present! She was a little confused as to what was happening, but sure enjoyed her new toys! We had a wonderful breakfast then went to our friend's house for a very simple, but fun Christmas dinner. New Year's Eve or Nochevieja (old night) is spent with friends and family celebrating into the early early hours of the morning. Many people eat dinner with their family but then head out to celebrate in the restaurants, bars and streets with their friends. This part of the celebration is called cotillón. Everyone wears their red underwear for good luck -- and eats grapes! Las uvas de la suerte -- the grapes of luck -- is such a fun tradition. At the stroke of midnight, everyone in Spain eats 12 grapes to signify good luck for each month of the year, one grape per month. You must finish eating your grapes before the clock stops chiming. So yes, Trevor and I spent the first moments of the new year shoving our faces with grapes and not having our first kiss of the new year! The TV stations all show the clock in Madrid's Plaza Mayor chiming at midnight and they have a grape counter to help you make sure you eat all your grapes. We cheated (a little) by buying seedless and peeled grapes to help you eat them faster -- all the grocery stores sell packages of 12 grapes in the weeks leading up to New Year's Eve. In theory we should have a good year since we both ate our grapes before the clock stopped chiming. Then New Year's Day is spent recovering from the whole night of partying. Don't worry -- the holiday season is not over yet (and yes, children are still out of school). The big day of the holiday season is on January 6 -- Three Kings Day or Los Reyes Magos (or Los Reyes) -- some may know this date as Twelfth Night and/or Epiphany. On the evening of January 5, the Three Kings visit the children and leave presents, just like Santa Claus does for many American children on Christmas Eve. Instead of visiting Santa's prior to Christmas, Spanish children visit the Three Kings (yes, there are actually three kings at most locations) leading up to Los Reyes. Families also eat Kings Cake or Roscón de Reyes -- sadly all the ones I found had nuts on them, so we didn't enjoy a cake. We did save one present for Serafina to open on January 6 as this will be a fun tradition to carry on even after we've left Spain. 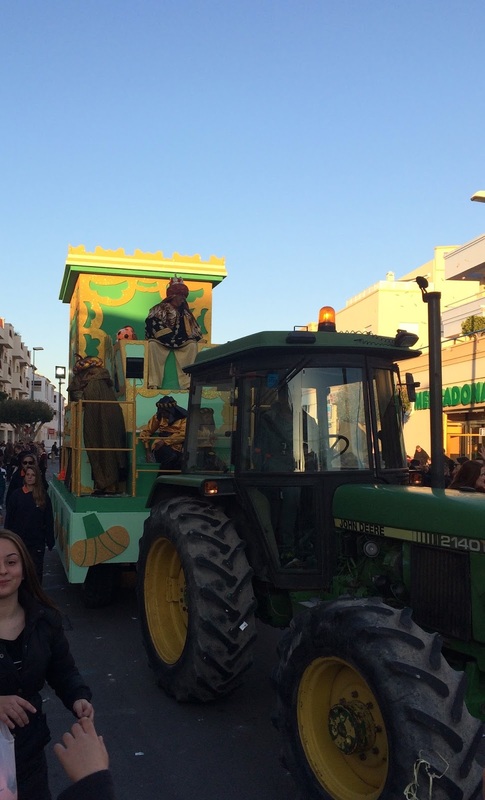 The best part of Los Reyes (in my opinion) is the parade or cabalgata. 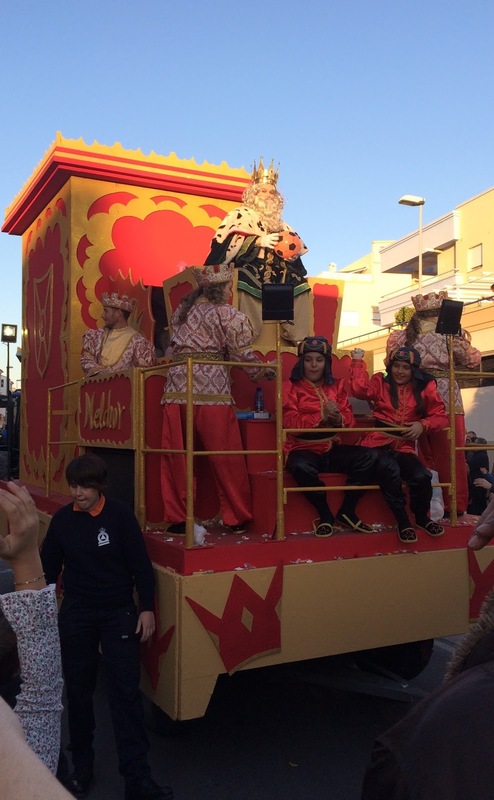 On January 5, most towns have a parade (or two) of the Three Kings coming into the town greeting all the children and throwing massive amounts of candy. We went to our town's parade and it was SO MUCH FUN. We met up with some friends right around the corner from our house since it turns out we live right by the parade route. We had heard that kids bring umbrellas to catch all the candy... we thought this was a little crazy.... but then we realized what a genius idea it was! There were probably six or seven floats (one for each king and then a few others) and every single float PELTED (not handed, not threw but straight up pelted) candy at all the kids. It was literally raining hard candies throughout the parade. We were ducking and laughing and scooping up candy as fast as we could. I am fairly certain the adults were having more fun! 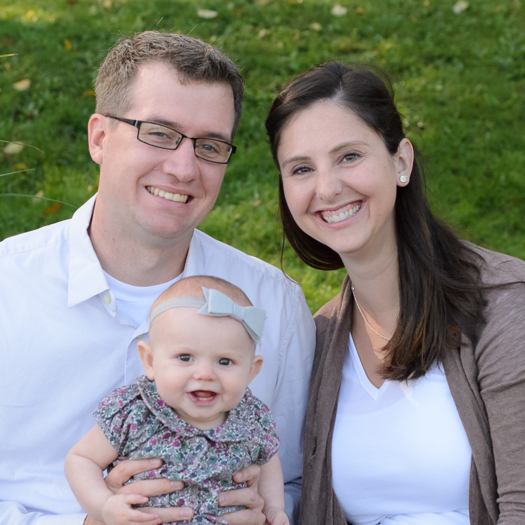 While the pictures don't show it -- Serafina had a blast, even as she was getting hit with candy! So there you have it -- how Spain celebrates the holidays. It was such a fun first holiday season in Spain. 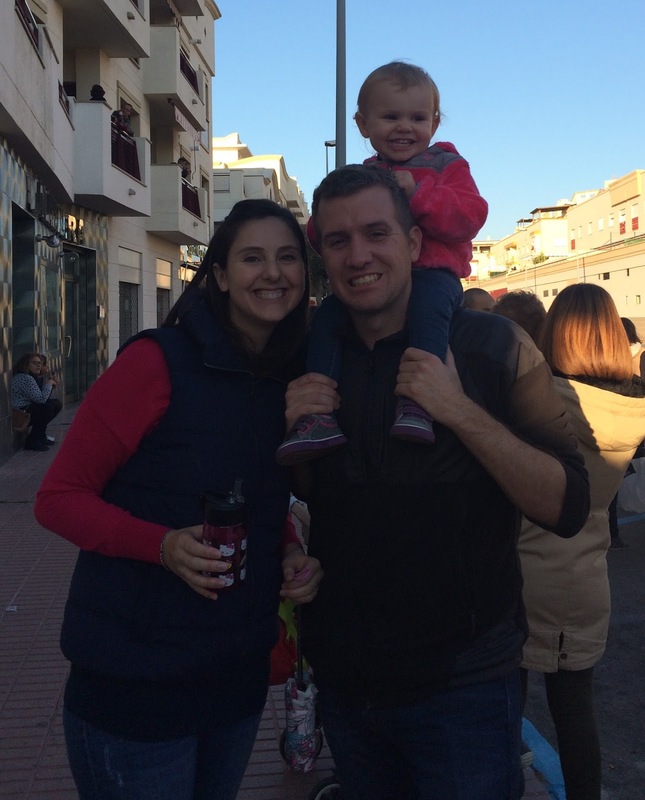 We seriously loved the live nativity in Arcos and adding some new Spanish traditions to our own holidays.